Where did that blog go? Things have been looking a bit quiet on Harping On, as I’ve been busy with the OU’s new MA in Creative Writing. Writing about writing has therefore taken a back seat. Along with that has come a little bit of a desire to do less in the way of social media – it’s good to create a bit of space sometimes. In the meantime, the German version of my story ‘Ships that Pass’ has been published in the anthology ‘Vierertreffen’, which means a Meeting of Four. I haven’t met the other three authors in real life, but perhaps I will some day. Two of us are from Scotland, two of us are from Ireland – hello to Brian McNeill, Rita Kelly and Micheál Ó Conghaile – and many thanks to Karin Braun and Gabriele Haefs for compiling this volume of four ‘long short stories’. I’m half way through the first year of the MA course, where I’m studying Poetry as my primary genre and Fiction as my secondary. This is the opposite way round from what I originally intended – I just thought it would be more interesting to develop the poetry side, as I felt I had a lot to learn about doing it better. So far, the course material has been stimulating and people are contributing some interesting stuff in the online tutor group. I’ve been challenged, pushed in a few new directions and received some home truths about improving my focus. The downside is that it is all online – you don’t meet the tutor or participants, and there is an awful lot of screen work and clicking, which has given me some RSI problems … another reason for being a bit quiet on the blog. In the pursuit of more poetry-sharing with real people in the real world, I’ll be co-leading a poetry workshop with local poet Geraldine Green on 25th February. This workshop is one in Geraldine’s ‘Write on the Farm’ series which I’ve been attending for a year or two. When someone discovered I had a harp they wanted me to bring it to the party, and this workshop is the result! We’ll be looking at the origins of the instrument, talking about lyric poetry and writing in response to harp music. Time in the outdoors is always a part of Geraldine’s workshop, as is some quiet writing time in the afternoon. It is already fully booked! It’s been a turbulent five months for me as I have been going through cancer treatment, but I’m coming out the other side now and enjoying the spring sunshine as well as the daily prompts for NaPoWriMo 2016 which I’ve been posting on my blog throughout April. Thanks go to my husband Iain for dealing with a lot of the book administration when I wasn’t up to it! Thanks also go to all the people who have kept me cheered with cards, flowers and chocolates. The parcels are still coming! Yesterday brought this delightful selection from Gabriele Haefs in Germany. 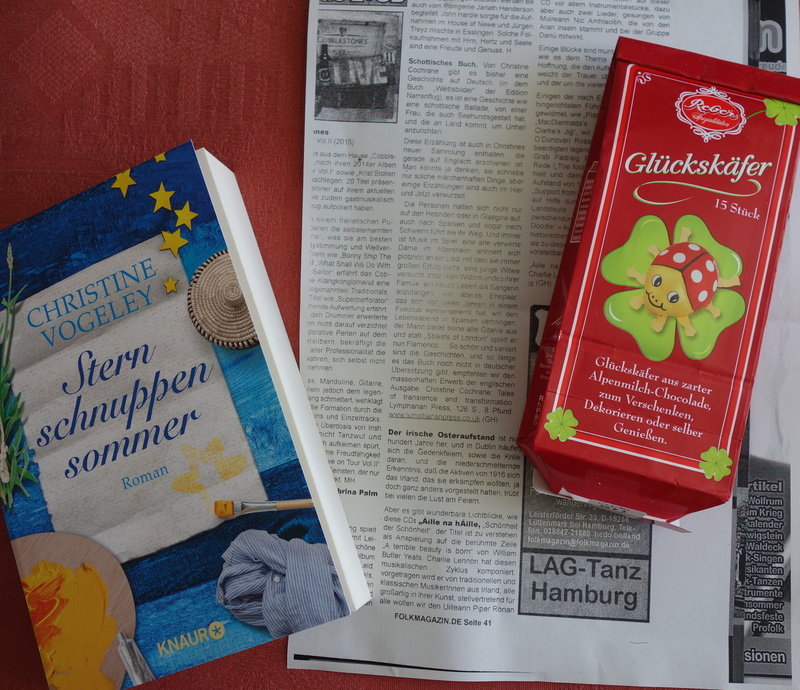 I’m delighted to receive this signed copy of Christine Vogeley’s ‘Sternschnuppensommer’, some chocolate and the first review of ‘Shifting Sands’ in German, written by Gabriele for Folkmagazin. Scottish Book: One of Christine Cochrane’s short stories has appeared in German (in the anthology ‘Weibsbilder’ from Edition Narrenflug). It’s a story a bit like a Scottish ballad about a ‘selkie’, a seal who takes the form of a woman and who comes on land to create misfortune. This story appears in Christine’s new collection of short stories which has just come out in English. You might imagine that she only writes fairy-tales like this one, but the other stories are firmly rooted in the here and now. The characters are not just in the Hebrides or Glasgow. She takes us to Spain and even to Schwerin in Germany. And music is always there in the background; a confused old lady in a care home suddenly remembers a song that she once sang with great success, a young widow wants a new life as a singer despite the resistance of her family. And there’s a middle aged couple who retire to Spain; the husband unpacks his old guitar and instead of playing ‘Streets of London’ learns flamenco. That gives an impression of the nice variety of the stories! It’s not yet available in German, so we recommend getting the English edition through http://www.lumphananpress.co.uk. I’m very pleased to announce that my short story ‘Treibsand’ has completed its long journey from my computer to the German anthology ‘Weibsbilder’, published this week by Edition Narrenflug. The anthology has been compiled by Karin Braun and Gabriele Haefs. When I began to write ‘Shifting Sands’ as an Open University assignment, I never imagined that it would win a prize and that I would subsequently be invited to translate it into German. As the Germans say, ‘das Leben schreibt die besten Geschichten’ – life writes the best stories. I’ve had many special connections with Germany since my first trip there at the age of 17, and this latest chapter has been an exciting development. What I also like about the ‘Weibsbilder’ project is the mix of writers old and new, from Germany and from other countries. ‘In March 2014, Gabriele Haefs, Gudrun Völk and I gave a reading in Kiel Central Library. The theme of the talk was different perspectives of women, and the images and stereotypes that people hold. After the audience were suitably delighted by our reading, the three of us headed for the legendary Club68 to celebrate. As I was heading there, I was already thinking. My colleagues’ stories had touched me deeply and I wanted to stick with this topic. In our subsequent exchange of emails, it was clear that Gabriele was thinking the same way as I was – that it would be a great theme for an anthology! As neither of us likes to put off a good idea, we set about sketching out a plan. It would be stories by women about women. We wanted to include some classics, as we’d done with our previous anthology ‘Narrenflieger’ (Edition Narrenflug, compiled by Gabriele Haefs). We chose Franziska zu Reventlow, Marie zu Ebner-Eschenbach and the Norwegian writer Dikken Zwilgmeyer as our voices from the past. But we also wanted to have writers who had never been published in Germany. The Internet proved helpful. Gabriele found Joanna Sterling’s website ‘The casket of fictional delight’. Joanna’s contribution was ‘Lady Elfleda’. The second new writer was Christine Cochrane, a Scot living in England, whose story ‘Shifting Sands’ had won third prize in the 2014 Short Story Competition of Mslexia, an English magazine for women who write. As luck had it, Christine Cochrane was also a German teacher and translated her story into German herself. And so ‘Treibsand’ joined the ‘Weibsbilder’ anthology. There were new voices among the translators, too, alongside established names like Gabriele Haefs and Dagmar Mißfeldt. Maike Barth translated ‘Häutung’ from Norwegian. Hannah Kleber translated Laila Stein’s ‘Leerraum’, also from Norwegian. 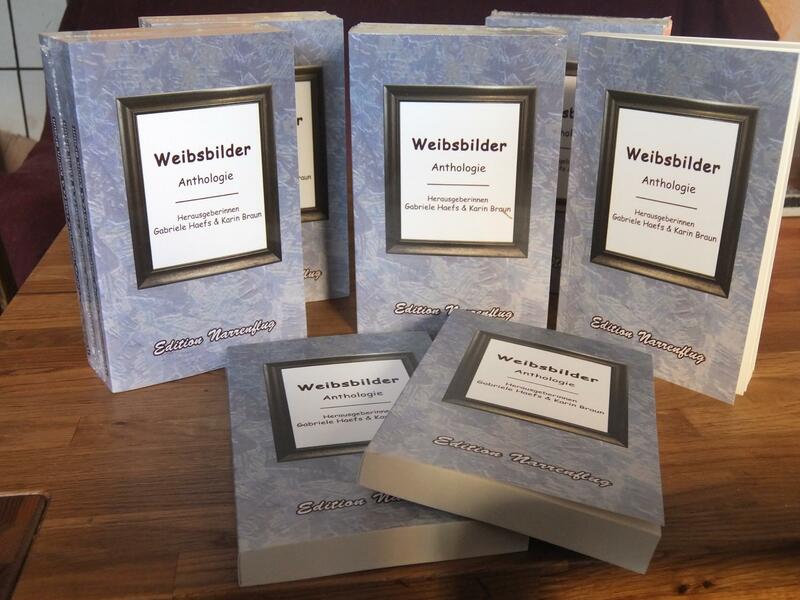 ‘Weibsbilder’ is available as a book or e-book from Edition Narrenflug. It will be available on Kindle from 1st March 2015. Finally, I’d like to thank Karin and Gabriele for their support and for the interesting ‘workshopping’ we did on some of the untranslatable words! Summer’s over and I’m back at the computer most mornings getting into writing gear again. With my Open University Creative Writing modules behind me, it’s been more challenging as I have to set my own goals and targets and decide my future directions. After that there was a bit of a lull. And then Write-Track came along, a new website for writers with the motto ‘finish what you start’. The idea is that setting goals and tracking how often you write will help you achieve your aims. The website also promotes a sense of community, as writers share their thoughts and their progress. So far it seems to have worked for me, pushing me from ‘I might write today’ into ‘I will write today’. It’s created quite an energy, and I got round to submitting some poems to competitions and anthologies. It also made me review my radio play ‘Ships That Pass’, which was my final assignment for my Open University course. Based on some family diary fragments, it is about a young widow in Edwardian Glasgow and the lure of a trip to America. To qualify for submission to the BBC Writers’ Room I had to extend it from 30 minutes to 45. It was quite difficult to go back and change something that I had regarded as finished, but the ‘extensions’ grew organically over time and I reached the required length. I quite like its new look. My dream is to develop this story into a novel, but it will take a bit more thought! In the meantime I’m continuing with some more short fiction and poetry projects. Thank you to Bec at Write-Track for setting up the website at https://www.write-track.co.uk!